Dusk isn’t shy about its reverence for 90s FPS classics like Quake, but it’s been long enough since the last old-school shooter revival that I don’t think anyone’s about to complain. Folks have been playing the first episode of the game since the preview went up as a preview bonus, but there’ve been some significant changes to how the rest of the game is getting released. Want games that are actually old? Check out the best old games on PC. 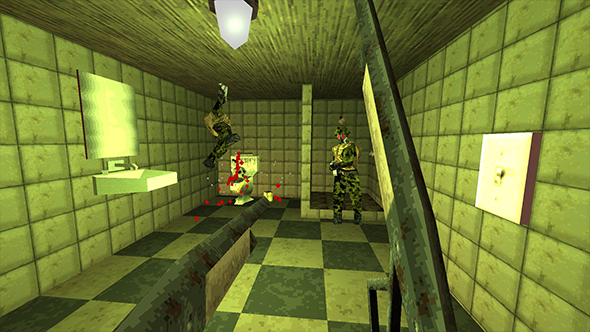 Instead of coming out “when it’s done,” Dusk will now release in Early Access on January 11. This release will include Episode 1, Episode 2, and the DuskWorld multiplayer open beta. The developers promise – literally – the game won’t be spending long in Early Access, with a final release to come “within the next few months.” The game is a flat $20.00 / £15.00 / €20.00 on Steam, and will apparently never exceed that price. If you pre-ordered the game prior to Christmas Eve (that’s December 24 for the calendar-challenged), you’ll be getting a free upgrade to the Digital Collector’s Edition, with soundtrack and comic included. The developers are pretty cognizant of the less-than-stellar reputation Early Access can tend to have, particularly among the kinds of players who might be looking to an explicitly Quake-inspired FPS. But it seems Valve suggested that the program would be a good fit, and with a major multiplayer addition coming the developers didn’t want to stress their capabilities to the breaking point. Either way, Dusk continues to look very cool, and you’ll be able to play most of it sooner rather than later.